Did you know one of the quickest, easiest ways to improve your appearance is teeth whitening? You can schedule an appointment at your local cosmetic dental clinic in Manahawkin for a quick treatment to boost your confidence, enhance your smile, and share your joy with the entire world. What’s more, 86 percent of Americans in a study completed by the AACD stated they get cosmetic dental treatments to improve their attractiveness. 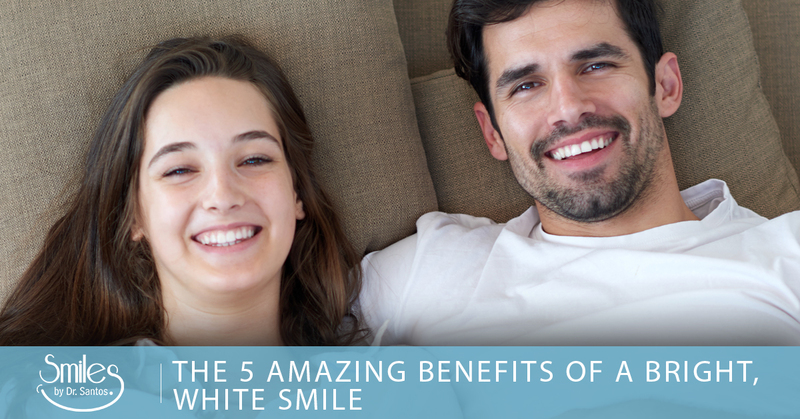 With that being said, here are the top five benefits of having a bright, white smile. Those who whiten their teeth tend to look more attractive to others. A bright, white smile improves appearance and creates opportunities for wonderful first impressions. A great smile gets you great reactions. Don’t miss out on life because of your smile. If you whiten your teeth regularly, you will begin to get compliments and comments on how beautiful your smile has become. What’s more, when you smile into the mirror each morning and every evening, you will feel happy about how wonderful your smile looks. This helps boost confidence, which trickles into other areas of your life. Teeth whitening won’t get rid of wrinkles, but a bright, white smile helps “mask” wrinkles. Here’s how: When you have a beautiful smile, people tend to focus on that instead of your wrinkles. Furthermore, a healthy smile attributes to reducing stress. Guess what is proponent of wrinkles? Stress. Those who smile more tend to find more opportunities in their personal and professional lives. Your own bright, white smile will encourage you to do more smiling, which can lead to career advancement and relationship fostering otherwise lost due to an unattractive smile. Although teeth whitening is a cosmetic dental treatment, it can have a positive effect on your overall oral health. A clean smile is easier to maintain than one that is already suffering from plaque buildup or gum disease. In most cases, a teeth whitening procedure will follow a thorough teeth cleaning so that you can make the most out of your whitening treatment. If you’re in need of teeth whitening, Dr. Santos serves the residents of Manahawkin with cosmetic dentistry treatments. Whether you want to straighten your smile or simply brighten it, you will find the dental clinic welcoming, warm, and comfortable. As you decide how you want to enhance your smile, make sure and schedule your appointment with our office early so you can experience the benefits of a beautiful smile as soon as possible. We look forward to seeing you!